For serious players of the washboard (although good luck finding one who’s all that serious), a trip to Logan, Ohio, is like a pilgrimage. 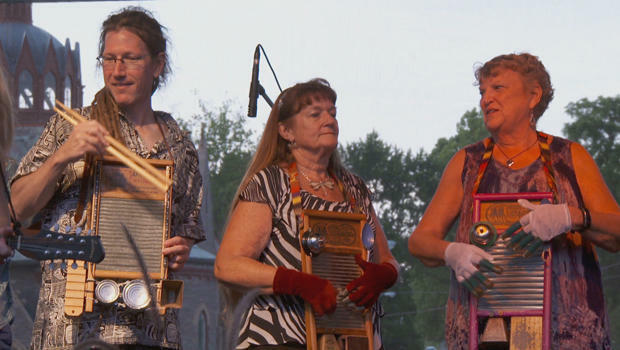 The annual Washboard Music Festival is a chance to celebrate the small town’s most unusual small business. Logan is home to the last washboard manufacturer left in America. Barnett couldn’t resist the opportunity to buy the last one left. But after she took over the business in 1999 and moved it to Logan, she started noticing that some of her washboard customers had no interest in washing. “We believe about 40%,” Barnett replied. At its core, it’s just metal and wood, typically played with thimbles to avoid hurting your fingers. Washboard Hank – he wouldn’t tell us his real name – makes his living as a full-time washboard musician, although he says he does not do it for the money. “I don’t have a washboard-shaped swimming pool, if that’s what you’re asking,” Washboard Hank said. “You know, who knows? One of these days, we might have to use them again – and I’ll know how!” laughed Barnett. Yes, she is prepared for the “Washboard Apocalypse.” Should that day ever come, Logan, Ohio, will be the town you’ll want to head to. Just don’t forget to pack your spoons and your thimbles.